Joey Meninga has been a late addition to the Vanuatu Rugby League squad to face the Philippines in Santo next Saturday. 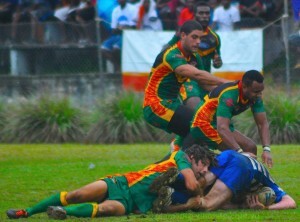 Meninga, the nephew of Mal Meninga has played in all three Test matches for Vanuatu. Meninga currently plays as a winger for the Sunshine Coast Falcons in the Queensland Cup but is again expected to start in the second row where he has exclusively played for Vanuatu. This entry was posted in Uncategorized on October 4, 2014 by Ben Howard.